Caramel Apple Crunch sold in wholesale and bulk sizes. 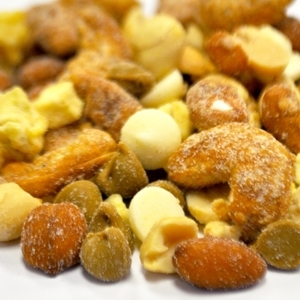 INGREDIENTS: PEANUTS (WITH PEANUT OIL, SALT), TOFFEE CASHEWS (CASHEWS, SUGAR, HONEY,SALT), BUTTERSCOTCH CHIPS (SUGAR, NONFAT MILK POWDER, PARTIALLY HYDROGENATED PALM KERNEL OIL, COCONUT OIL,WHEY (MILK), SOY LECITHIN, MONOGLYCERIDES, COLOR ADDED INCLUDING (BLUE 2 LAKE, YELLOW 5 LAKE, YELLOW 6 LAKE, & TITANIUM DIOXIDE), CARAMEL PEANUTS(BLANCHED PEANUTS, SUGAR, CORN SYRUP, VANILLA EXTRACT),HONEY ROASTED PEANUTS (PEANUTS, SUCROSE, PEANUT OIL, WHEAT STARCH, MALTODEXTRIN, HONEY, LACTOSE, SALT, XANTHAN GUM), VANILLA CHIPS (SUGAR, PALM KERNEL OIL, NONFAT MILK POWDER, WHOLE MILK POWDER, WHEY POWDER, PALM OIL, SOY LECITHIN, VANILLA), DRIED APPLES (WITH CITRIC ACID, SULFUR DIOXIDE (PRESERVATIVE)). ALLERGEN INFORMATION: CONTAINS PEANUTS, CASHEWS, SOY, WHEAT, COCONUT, AND MILK.